Archie Watson’s 10/1 Lambourn raider made all and ended up hanging on by a neck from fast-finishing favourite Time To Study. Mullen, from nearby Tranent, said: “I was praying for rain all the way up and he relished the heavy ground. He is a horse that is a pleasure to ride. He stays well and although he went clear he wasn’t doing a lot and had his ears pricked. 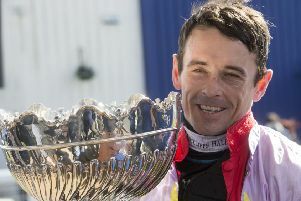 “It’s great to come back home and win a £100,000 race and hopefully all the problems at the course will get sorted out,” added Mullen, with reference to the ongoing power struggle between East Lothian Council and the committee who run the course. Book Of Dreams impressed for PJ McDonald in the Royal Mile Handicap. Sent off at 6/1, Mark Johnson’s gelding slammed Chingachgook by six lengths. The Middleham trainer’s son, Charlie, said: “He’s done that very well and seems a versatile horse as he’s also won on the all-weather at Chelmsford this year. Kevin Ryan-trained Lualiwa was the first winner of the new season on the level in Scotland when taking the 7f handicap in the hands of Kevin Stott. But the riding honours went to Ayrshire-born Danny Tudhope, who booted home a 103/1 treble aboard Kyllang Rock, Mayson Magic and Jacob’s Pillow. At Meydan last night, Thunder Snow benefited from a well-judged front-running ride from Christophe Soumillon to claim a surprise victory in the Dubai World Cup. Saeed bin Suroor’s charge had competed in each of the three rounds of this year’s Al Maktoum Challenge, finishing second in round one, winning round two and suffering an odds-on reverse in round three. Although a Group One winner as a two-year-old and three-year-old, he looked to have his work cut out in the feature event of the night, but appeared much improved under more positive tactics and secured an impressive success. Soumillon allowed Thunder Snow to roll along in front from the outset, with Bob Baffert’s red-hot favourite West Coast always in his slipstream. The American challenger looked poised to attack rounding the home turn, but it was soon obvious Thunder Snow had far more in the locker and he powered clear to score readily. West Coast just managed to hold on to the runner-up spot from stablemate Mubtaahij.